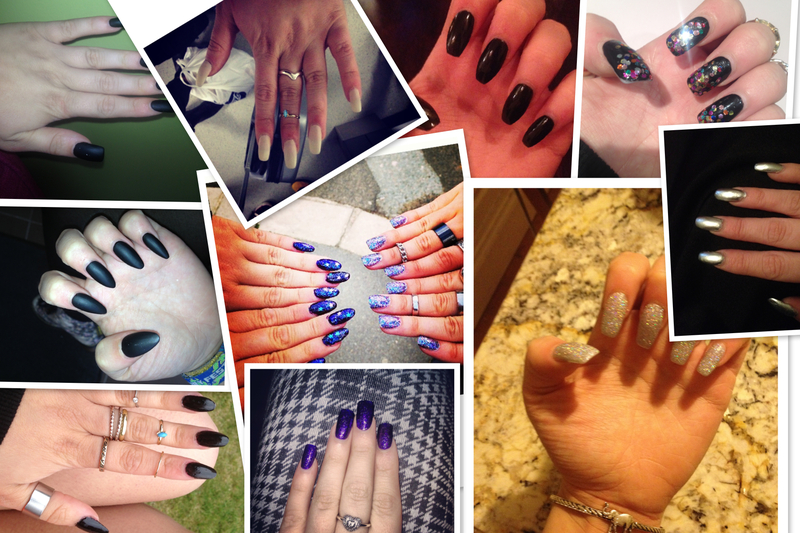 okay so we have a selection of manicures from every month in 2013. These also feature the practicaility of the nails because I work mainly with a keyboard and HOW annoying is it when you can’t do whats most important and TYPE because of your nails. Real problems. It’s never about following someone you kissed once three years ago on twitter because of the point on your stiletto. dark green squarletto: march brought the squarletto to my attention so of course I wanted to try it out (a bit hesitantly at first) and I grew to love them SO quickly. This gorgeous forest green makes me feel at one with nature. Get This Look with Morgan Taylor Lacquer Jungle Boogie! typing ability: difficult at first but easy to adapt! foiled squarletto: The end of May involved Evolution Festival which has seen a progressively worst lineup every year but that didn’t mean my manicure could also deteriorate. Nails Inc Foiled Effect literally blew my mind as within minutes my nails looked as if they had been dipped in silver. I felt rich and lavished. Get This Look with South Kensington Foil Nails Inc.
oval galatica: JUNE MEANS PARIS and paris means jazz. I think my explosion of excitement to be returning to Paris with my best friend again can be seen in my mani. Stars, Glitter, Iridescence and Purple; all of my favourite things! Jess even matched with me. Paris is always a good idea. To achieve this look simply paint your nails the desired colour and then different and every form of glitter varnish on top of it. Warning: can take a while to be removed. black matte stilettos: i had a bright summer but a solemn month. this month brought the end to many things and the only way to remove me from a hole of self pity was via my fierce stilettos. black to represent my mood, matte to represent my distaste and pointed to scare off ratchet hoes. Get This Look Black Onyx Opi & Matte Top Coat. Warning: be prepared to pierce through clothing (tights in particular) and be unable to roll cigarettes. black gloss squarlettos: 21st Birthday month! I wore a grey dress therefore I wanted to stick to my gut instinct with black and stiletto nails are no fun when drunk (you scratch EVERYONE) therefore I think this was a sensible choice for such an occasion. I enjoyed this look so much I kept it constant for all of September and October too. typing ability: my finger got caught in a drawer in work snapping my acrylic off which resulted in a visit to a&e.